Gearing up for Valentine’s Day or just looking for a great eatery to try over the weekend? Great food, great company and of course, ambiance are the three main ingredients that will decide weather you have fun or not? Oh Cha it is ! 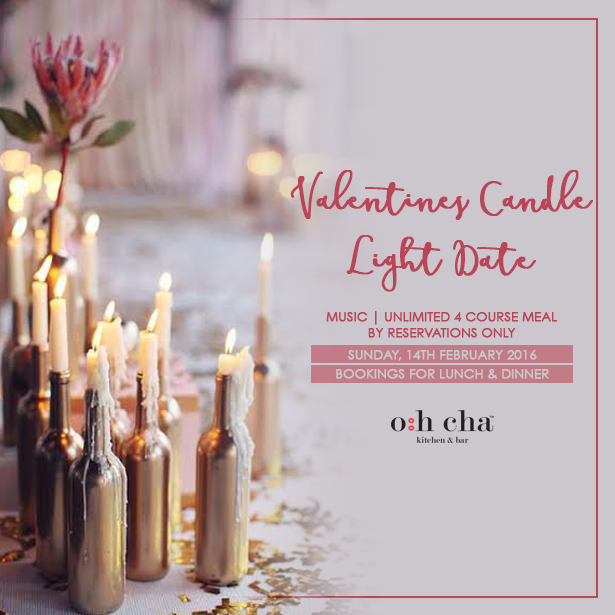 Oh Cha is hosting A Candle Light dinner INR 2500(AI) per couple for Valentines , which would include unlimited appetizers ,main course & dessert from the introductory menu. The quoted package also includes unlimited domestic liquor,housewine,&domestic beer. o:h cha is a unit of Golden Elephant Hospitality Pvt. Ltd. Renowned for its fine balance of the fundamental flavours - spicy, sour, sweet, salty and bitter - Thai cuisine emphasises balance, detail and variety. A unique flavour profile born out of the four main regions of the country - Northern, North Eastern (or Isan), Central and Southern - and influenced by its South Eastern neighbours, its evolution is wholly unique. An unforgettable blend of old and new, popular Thai dishes evolved from Chinese cuisine introduced to Thailand centuries ago.Our menu features a memorable selection of dishes from across Thailand, using only the freshest ingredients to ensure a truly authentic culinary experience.Experience Thai cuisine in all its authenticity, created especially for you by Master Chef Pipat Niyomsin.